Tennis elbow is very common, affecting 1-3% of the population but the name can be very misleading. (1) Today we are aiming to clear that up by telling you what it really is, how it happens and why physio is a must. So, yes it does affect a huge amount of tennis players (more than 50% of amateur tennis players! ), hence the name, but it can also affect a wide array of work as well, leading to a lot of lost work hours and productivity – not to mention the pain that you go through. 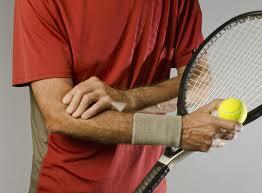 Tennis elbow affects the tendons of your forearm muscles where they attach into your elbow. It happens through repetitive overloading of the tendons, leading to micro-tears and the initiation of degenerative changes – Thickening of the tendons, sensitisation, increase in blood vessels and building cells. Think of it like this: You are using the tendon the same way over and over and over again and this overuse is too much for the tendon to handle (it gets tired, and fair enough too). So because of this it gets little micro-tears, kicking your body into action. It decides it needs to make it stronger by laying down more tendon fibres and other building blocks. But the problem is that this makes it thicker and dysfunctional because the new fibers are layed down all over the show – not in the correct alignment, leading to weakness and a real pain in the elbow. Pain usually comes on gradually and generally worsens with use, such as gripping or lifting. So what can be done to help your elbow pain? You should be careful not to over-use your arm and to avoid things that aggravate it or make it sore. This does not mean complete rest or immobilisation. Gentle controlled use is important for proper alignment of those messy fibers that were layed down. Ice and heat can be used as well, to decrease pain. Ice is generally used in the early stages with heat becoming beneficial later on. Your physio can guide you with this depending on what stage of tennis elbow you are in. 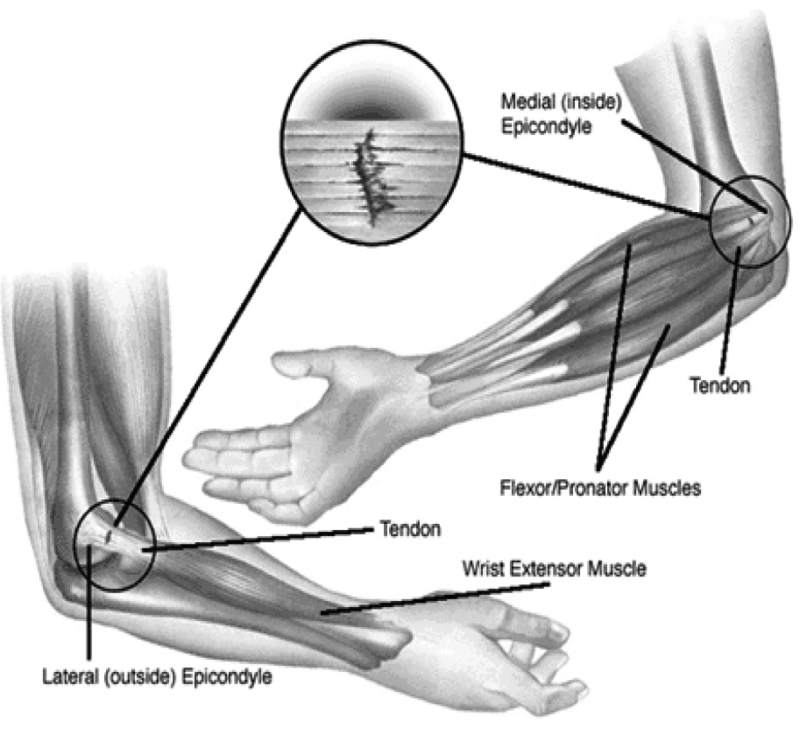 Physiotherapy to address muscle tension, really helps – this reduces the pull on the tendon, allowing it to heal. Having a full assessment so that the physio can find any deficits that may have caused this to happen is also important such as a stiff elbow joint or weak shoulder. Rehab exercises are a must – because as I explained earlier, the tendon fibers can become a real mess (think old bailing twine), we need to put the right forces through to re-align these fibers strongly, but it must be done in the right way to avoid aggravation. Your physio will prescribe these to you and guide you through. Brace up. Tennis elbow braces, to most people are very helpful and can immediately reduce pain, as well as adding compression, pain relief and helps with keeping the area warm. 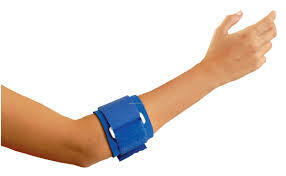 If you have tennis elbow and haven’t tried a good tennis elbow brace, come on in and see the difference. If you or a family member are having trouble with elbow pain, come on in and see one of the team at PhsyioSteps for some great advice, treatment and active rehab exercises to get you the best outcome.